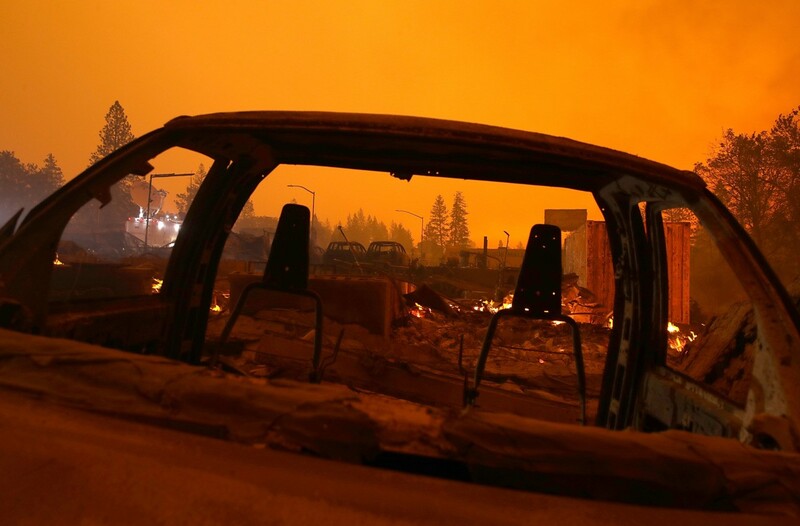 A wildfire blazing so quickly that firefighters couldn’t hope to stop it quadrupled in size Friday after destroying several thousand buildings and leveling much of a Northern California town of nearly 30,000 people, according to state authorities. 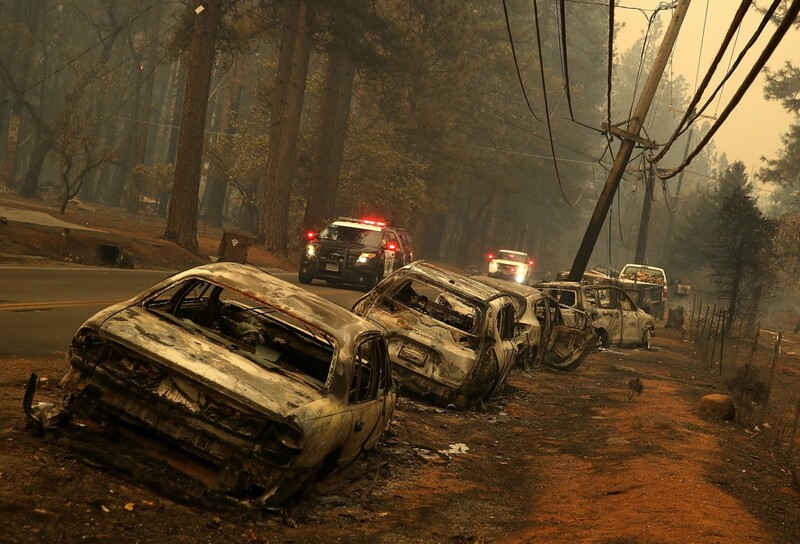 Law enforcement officials confirm at least 25 people were found dead in vehicles torched by wildfire flames. 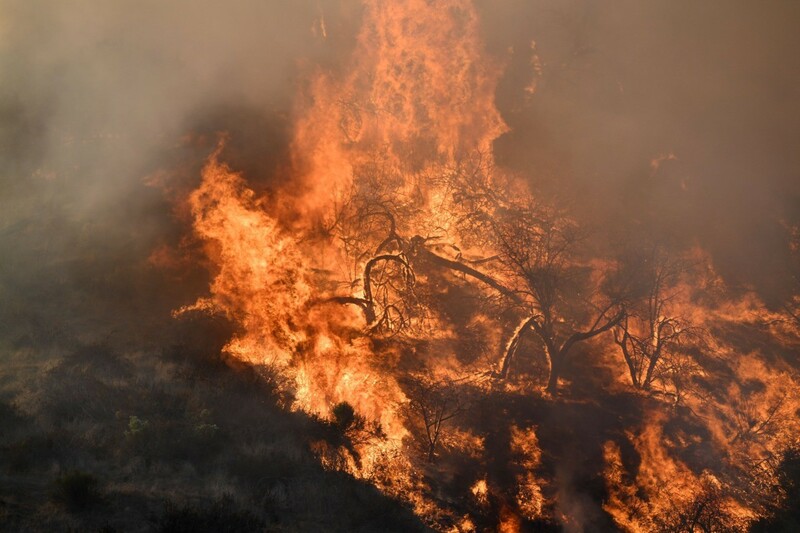 A wind-driven wildfire raged through Southern California communities on Friday, burning homes and forcing thousands of people to flee as it relentlessly pushed toward Malibu and the Pacific Ocean. 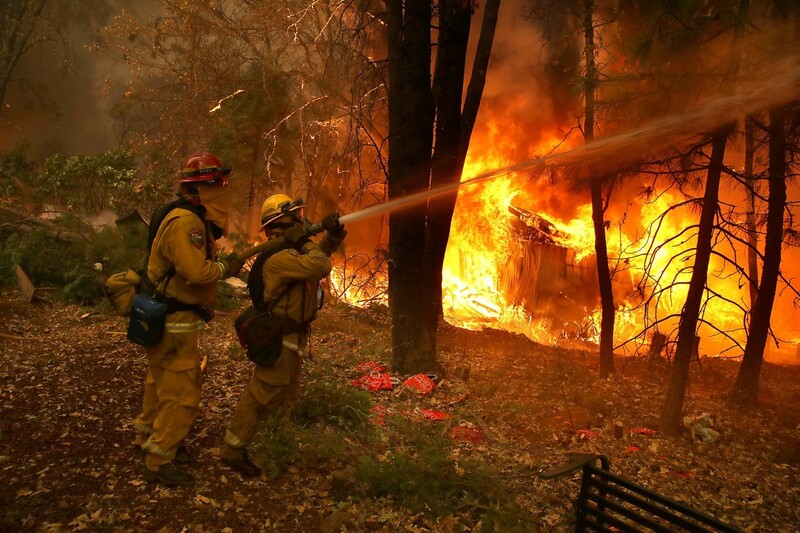 11:31 PM: The North California wildfire is now 5 percent contained. 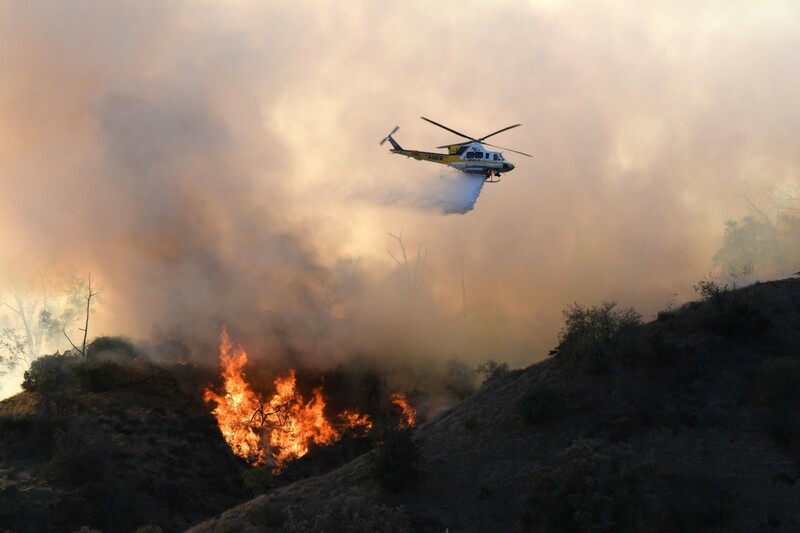 9:33 PM: The mayor of Thousand Oaks says that three-quarters of his city is under fire evacuation orders and that most likely includes people affected by the deadly bar shooting this week, according to the Associated Press. 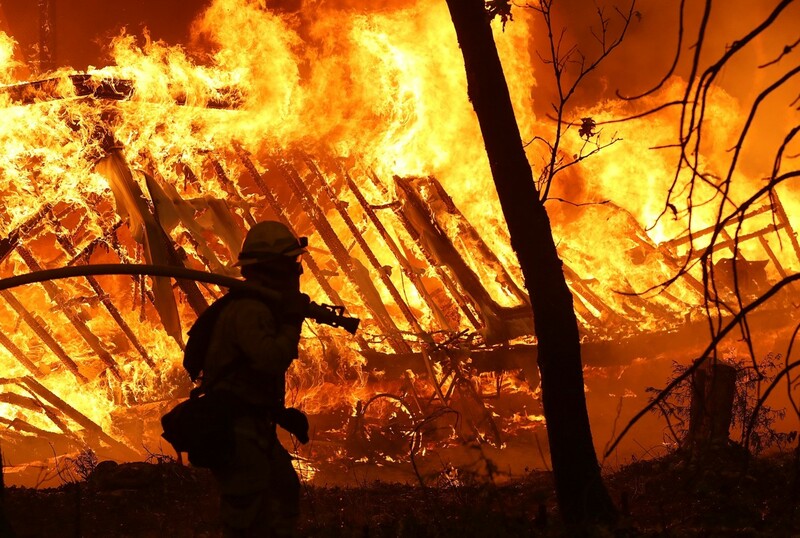 9:19 PM: The Camp Fire is now the most destructive fire in California’s history. 9:16 PM: The death toll has climbed to nine. 9:15 PM: Butte County official says two calls regarding possible looting were received. No arrested were made. 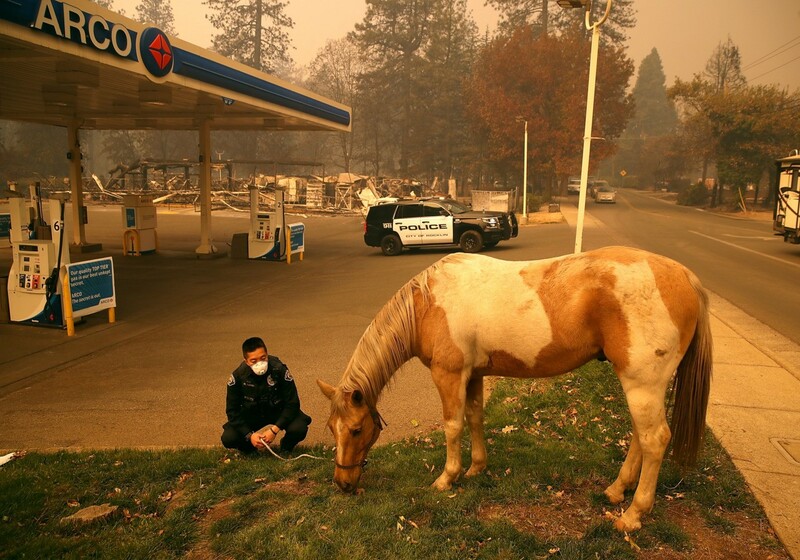 #BREAKING: Sheriff-Coroner in Butte County says two calls of looting reported in Paradise area after #CampFire, though no arrests made because no one located. 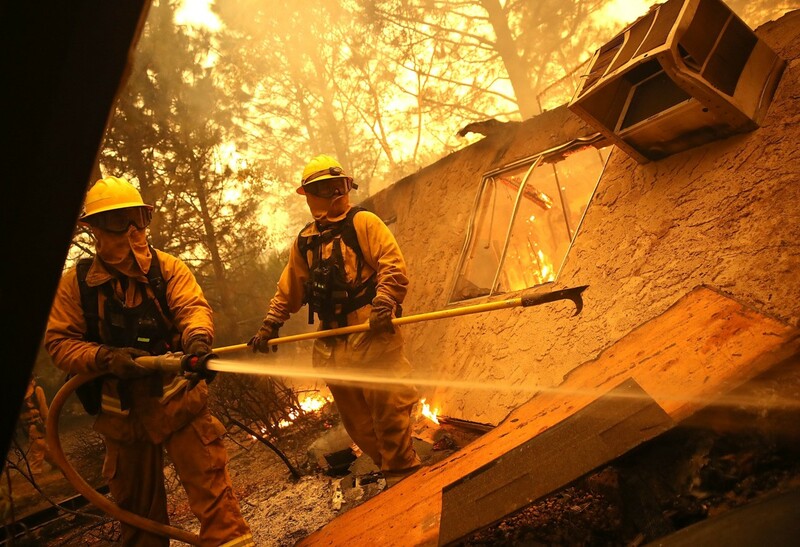 9:13 PM: Fire official says 6,713 structures destroyed in Northern California wildfire that has grown to 140 square miles, per the Associated Press. 9:12 PM: A weather update on the Chino area. 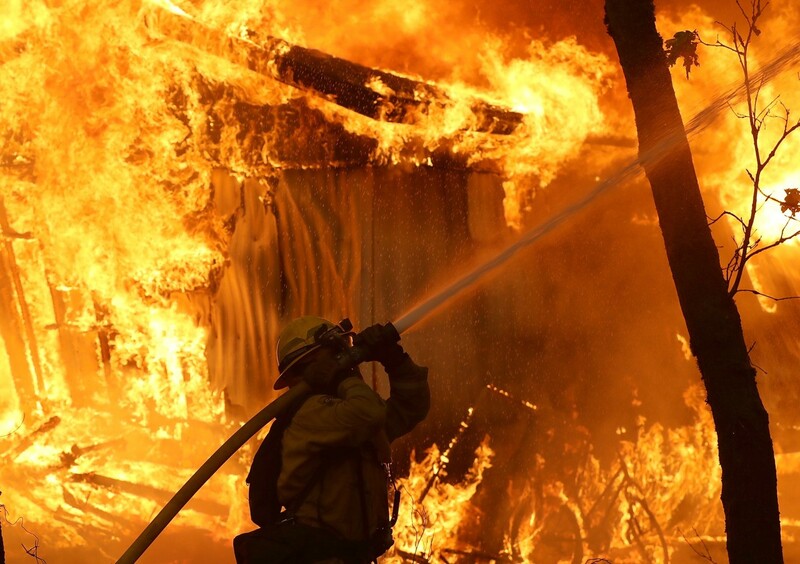 8:08 PM: A sixth person has died in the Camp Fire in Butte County, officials say. More details to come. 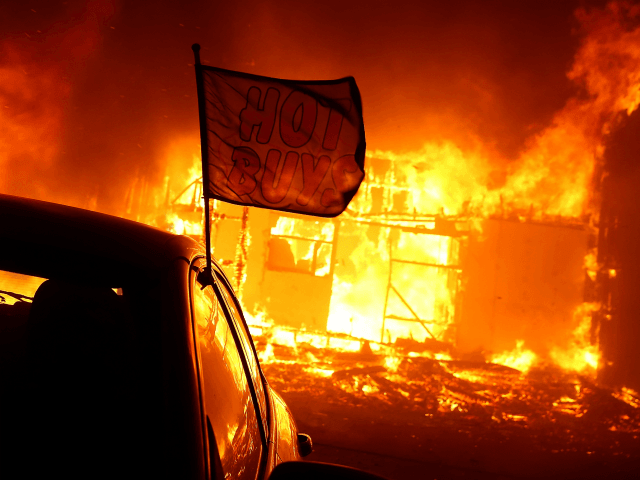 8:01 PM: People have scoured evacuation centers, called authorities and posted desperate online pleas for help finding relatives they haven’t heard from since a fast-moving wildfire devastated a Northern California town, according to the Associated Press. She and her brother posted on social media to see if anyone had seen Jean Forsman. They tried calling 911 and other numbers. They were told officials had a list of 300 to 400 welfare checks to do. Finally, they got word through Facebook on Friday morning that someone in her neighborhood had picked up a woman with disabilities. But the Forsmans haven’t been able to confirm yet whether it’s their mom. Many of the missing are seniors without cellphones or social media accounts who had moved to the Northern California area that’s known as a refuge for retirees. About one-fourth of Paradise’s 27,000 residents are 65 years or older. 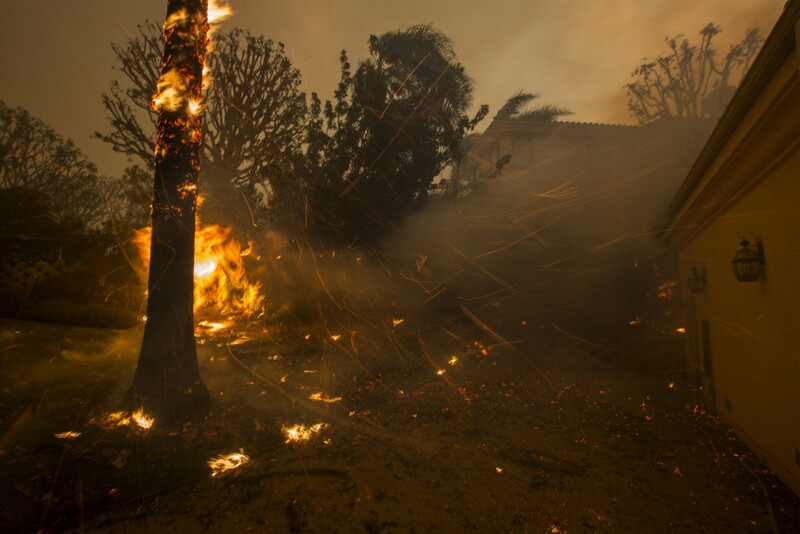 When it was time to evacuate, Suzanne Drews couldn’t get to her 84-year-old mother, who lives east of her in Paradise. Helen Pace lived by herself in a mobile home park with other seniors and didn’t have a cellphone. Drews registered on several websites set up for missing persons and went to evacuation sites searching for Pace. “I’m trying not to worry. 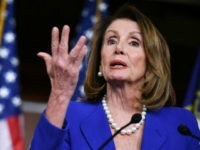 We’ll keep looking and praying,” Drews said by phone Friday afternoon. “I’m praying that she’s at peace, that she’s comfortable enough and not panicking.” Cherri Rolla’s family hasn’t heard from her 83-year-old aunt, Sylvia Johnson, who lives in Paradise with at least six dogs and three horses. Rolla said a grandson living nearby tried to get Johnson to leave Thursday but she refused. On Friday, they got a call that a woman at a church in Oroville may be Johnson. “We don’t have 100 percent confirmation that it’s her,” Rolla said. “I’m trying not to get too terribly excited.” Families were aided on Twitter by the actor James Woods who posted and retweeted messages from those looking for missing people. The hashtag he started became a central hub for people trying to reunite with their loved ones. Steve Christensen drove up more than 130 miles (210 kilometers) from Sutter Creek to Chico and spent Friday trying to find his wife’s sister, Debbie McCrea, and her boyfriend. 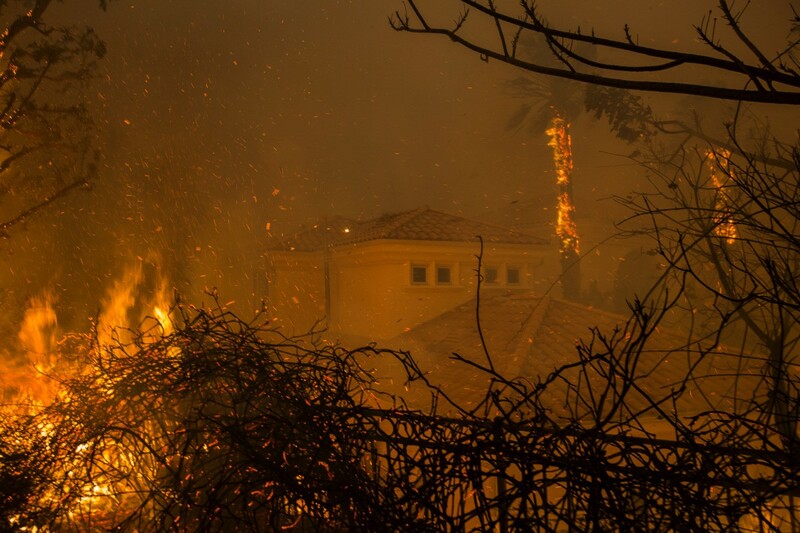 7:42 PM: Pacific Gas & Electric Co. says it experienced a problem on an electrical transmission line near the site of a massive fire in Northern California minutes before the blaze broke out, according to the Associated Press. 7:26 PM: The view in San Jose and San Francisco. 7:10 PM: Scenes from Malibu. 6:19 PM: Air quality update for northern California. 6:17 PM: Dramatic audio of firefighters responding to a downed transmission power line in Paradise. 6:07 PM: Law enforcement hand off a potbelly pig they found to Butte County Animal Control. 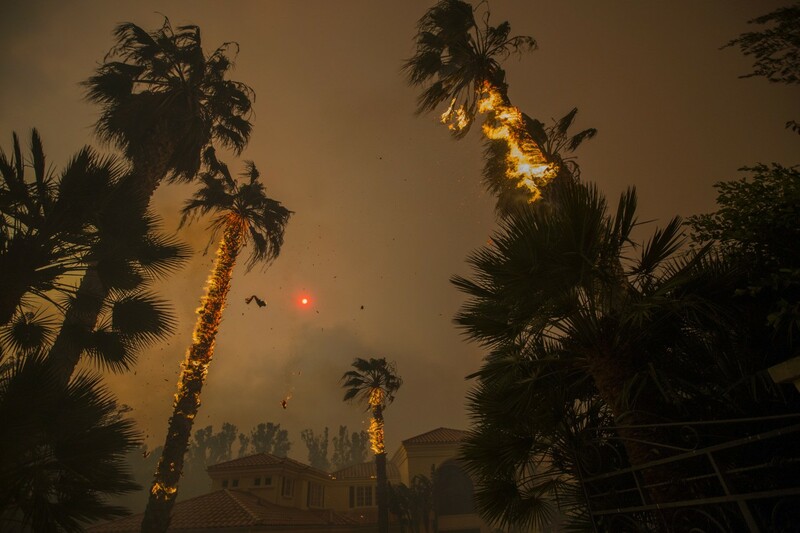 5:57 PM: Kim Kardashian West, Scott Baio, Rainn Wilson and Guillermo del Toro are among numerous celebrities forced to evacuate their homes, in some cases hurriedly trying to arrange transport for their horses, the Associated Press reports. 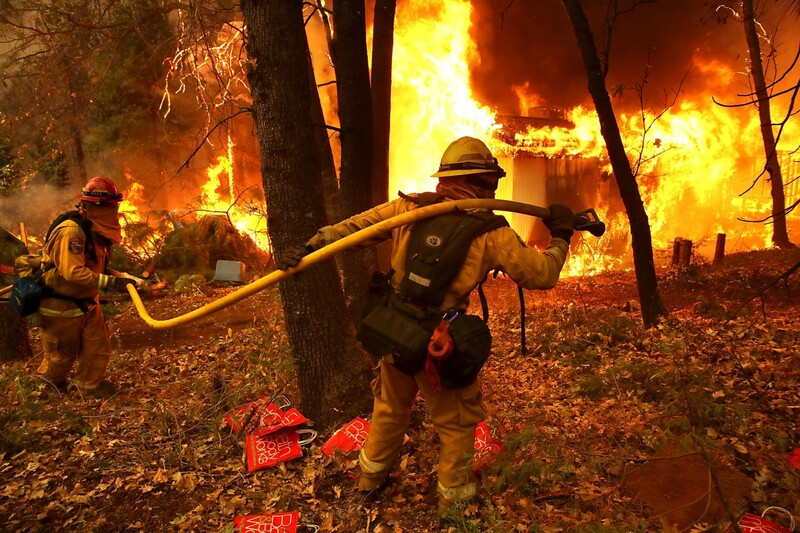 Some, like del Toro and Caitlyn Jenner, did not know the fate of their homes, but the wind-driven wildfire has destroyed the home of “Dr. Strange” director Scott Derrickson and the historic Paramount Ranch where shows like HBO’s “Westworld” and “Dr. Quinn, Medicine Woman” were filmed. The celebrity website TMZ reported that Jenner’s home was burned, but her publicist said that was not yet confirmed. 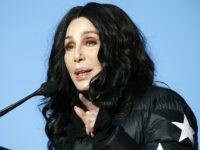 The Olympic gold medalist safely evacuated. The Santa Monica Mountains National Recreation Area said the Paramount Ranch known as the “Western Town” served as a location for productions ranging from 1938′s “The Adventures of Marco Polo” to TV shows “The Mentalist” and “Weeds.” The location known as “Western Town” is set in the mountains west of Los Angeles dates to 1927 when Paramount Pictures leased the ranch and began making films there. 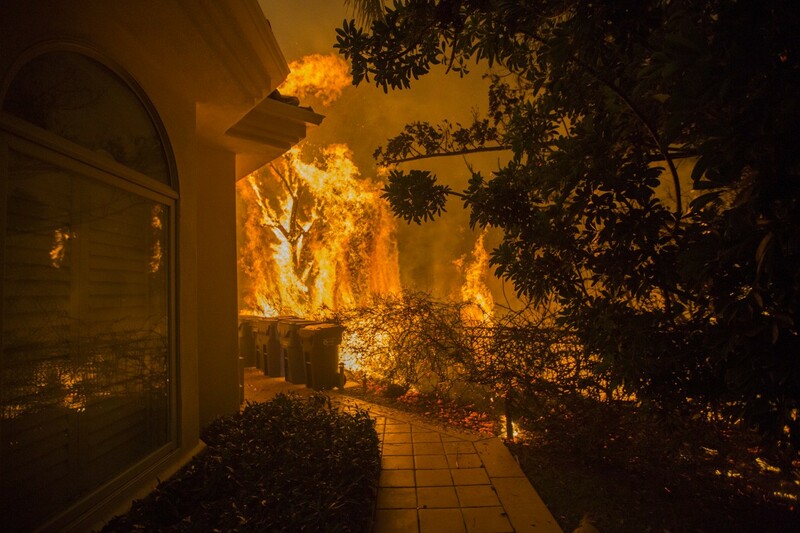 Actor James Wood asked nearly 2 million of his Twitter followers to use the hashtag #CampFireJamesWoods to help share names of those who are missing in a separate wildfire in Northern California that has claimed five lives. 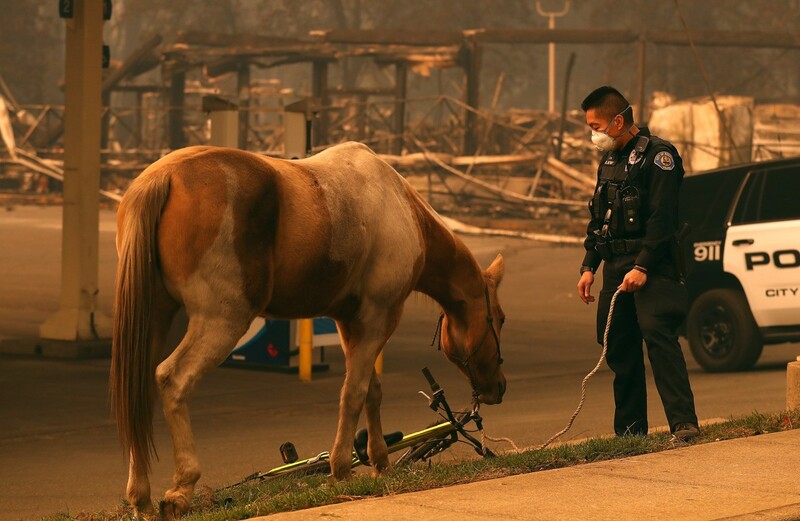 He also tweeted resources for horse owners to have their animals evacuated from the Southern California blaze, and called Milano’s report that her family and horses had been evacuated “good news.” Woods was not among those displaced — he tweeted that he was on the East Coast. 5:39 PM: Smokey skies in northern California continue. These pics from NASA show just how large the #CampFire, #HillFire, and #WoolseyFire are. 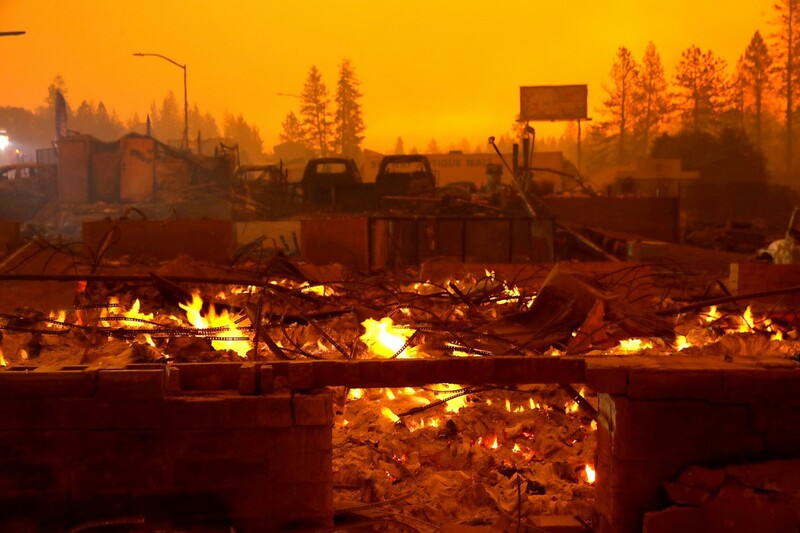 5:07 PM: Nurses and patients have recounted their dramatic escapes from a hospital in a Northern California town that was devastated by a ferocious wildfire in an interview with the Associated Press. 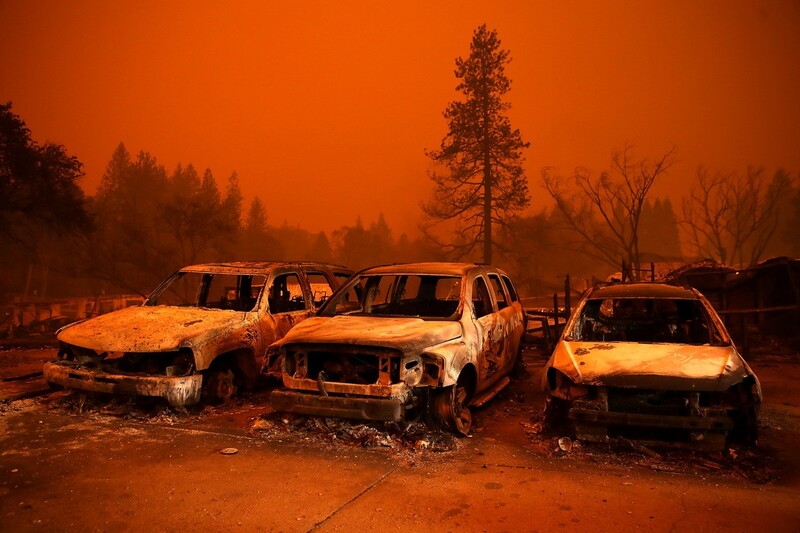 Nurse Darrel Wilken told the Chico Enterprise-Record newspaper on Friday that the fire in the town of Paradise came so quickly that he and other employees at the Feather River Hospital used their own cars to evacuate patients. 4:53 PM: More eye-popping scenes from Paradise. 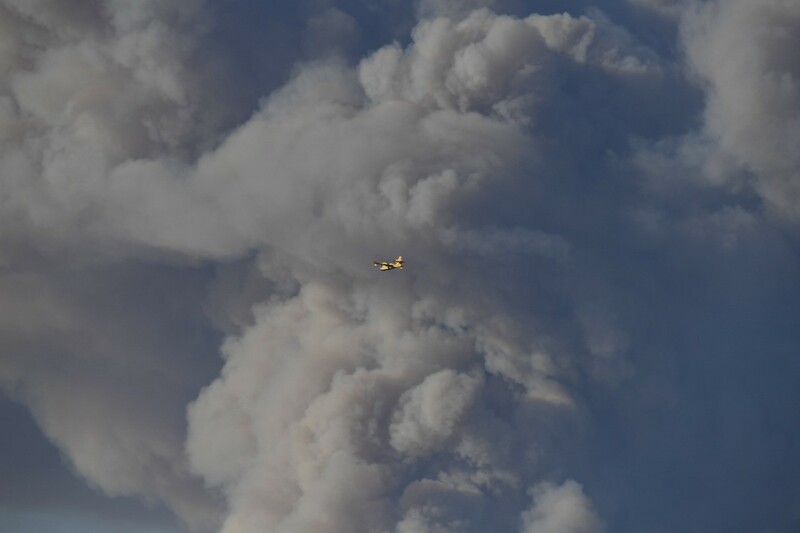 4:52 PM: Firefighters battle wildfire flames in Magalia. 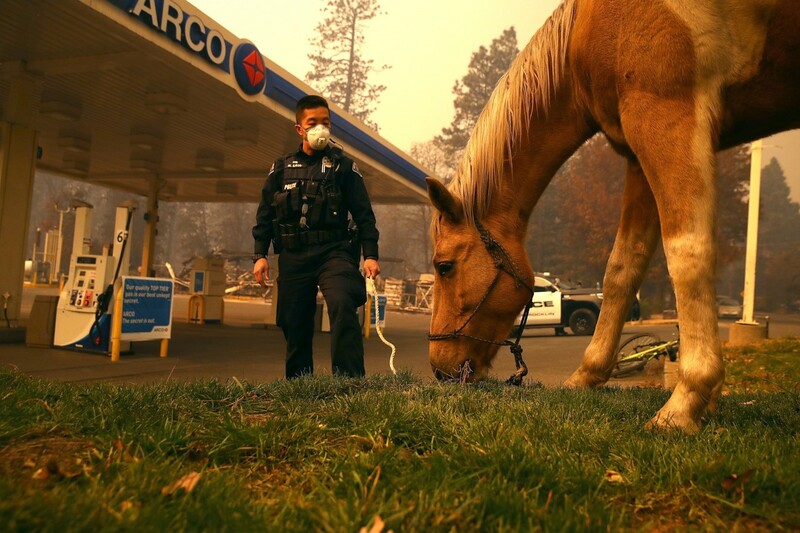 4:43 PM: Rocklin police officer takes care of a horse discovered wandering after the Camp Fire raged through the area in Paradise. #Woolseyfire *EVACUATION UPDATE* All of Monte Nido, north to Mulholland. 4:32 PM: Visibility issues persist in Chico as Camp Fire rages. South Bay foothills not visible at #49ers practice because of #CampFire smoke. 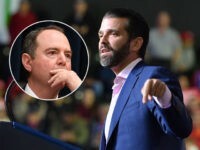 4:20 PM: There were no signs of life Friday on the road toward the town of Paradise except for the occasional chirping of a bird, write the Associated Press. A thick, yellow haze from the wildfire hung in the air and gave the appearance of twilight in the middle of the day. 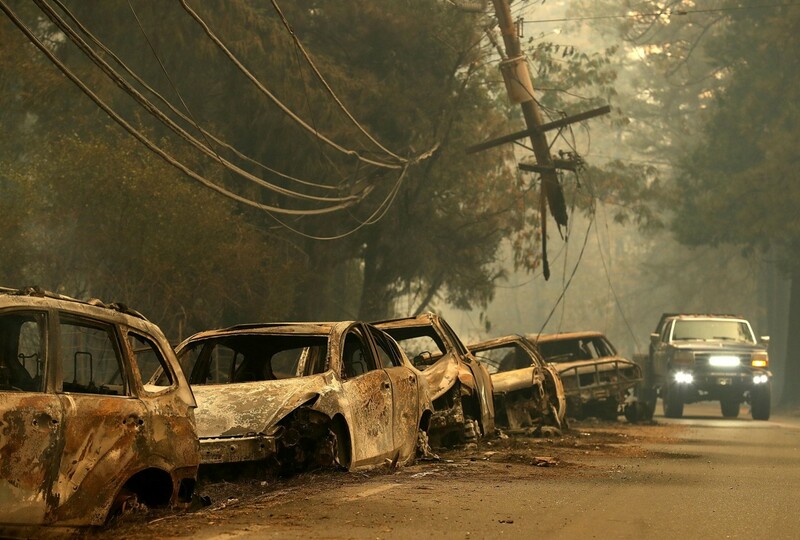 The town of 27,000 about 180 miles northeast of San Francisco was completely evacuated. NOW: Massive flames marching from the mountains all the way to the ocean. 3:49 PM: Feel good story about the Paradise Alliance Church still intact as the wildfire blazes. 3:42 PM: Smokey skies in Oakland. 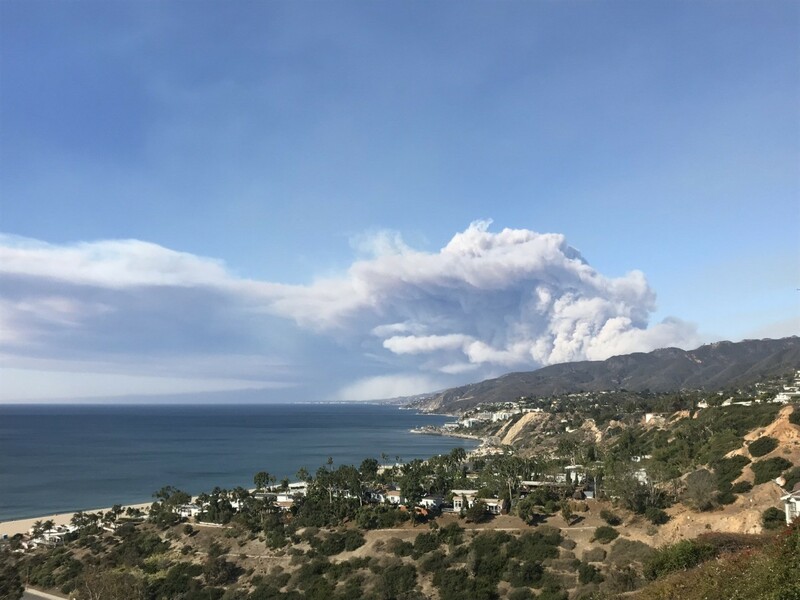 3:32 PM: Photo of the Woolsey Fire from Santa Monica. Just told by CUSD Superintendent Kelly Staley that all schools in Butte County will be closed all next week, by order of Butte County Office of Education. 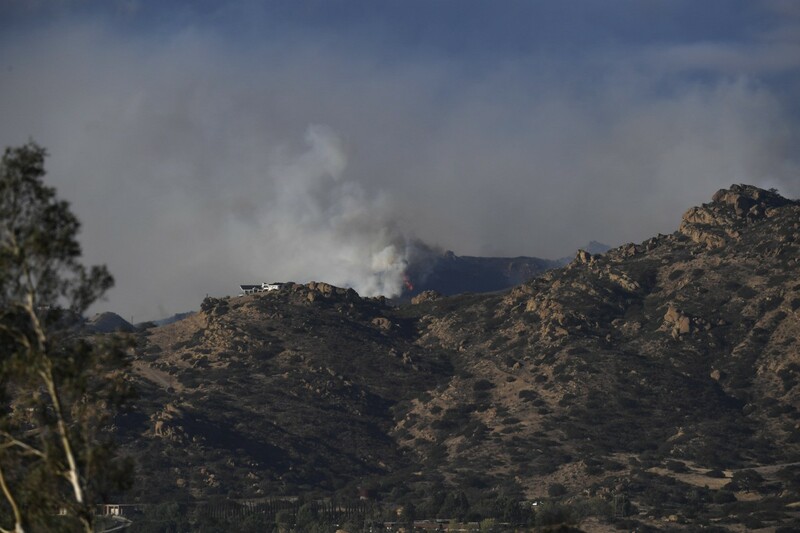 2:55 PM: Santa Monica Mountains National Recreation Area officials say the Western Town at Paramount Ranch in Agoura Hills has burned down. 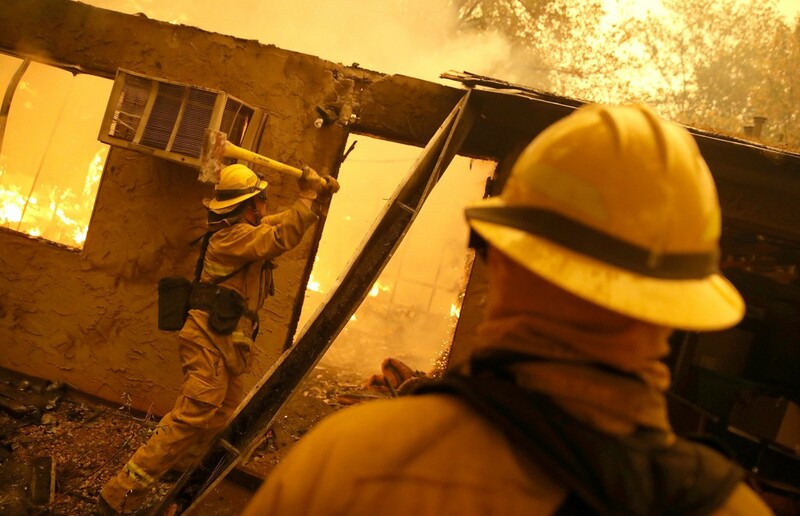 Los Angeles photojournalist John Schreiber shared photos of what appears to be the aftermath. The park service says the ranch served as locations for productions ranging from 1938′s “The Adventures of Marco Polo” to TV’s “Dr. Quinn, Medicine Woman,” and the more recent shows “The Mentalist” and “Weeds,” the Associated Press notes. 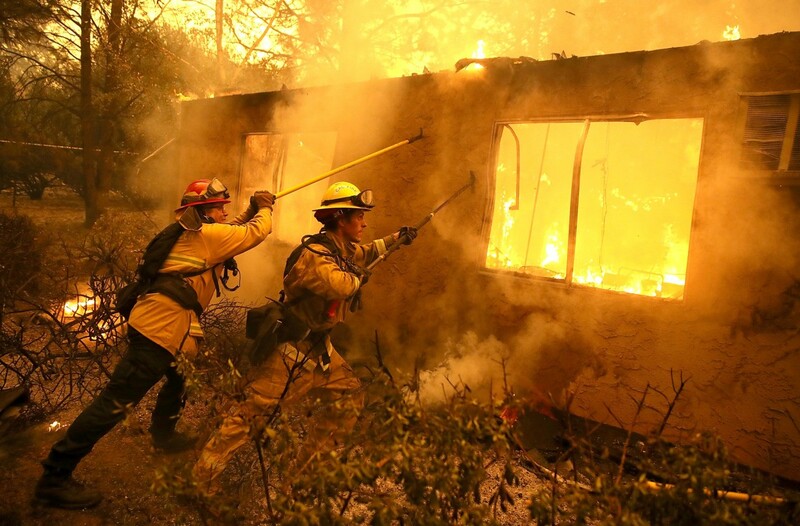 2:35 PM: Sheriff’s officials in Northern California say the five people found dead in vehicles torched by a wildfire’s flames could not immediately be identified because of the burns they suffered. 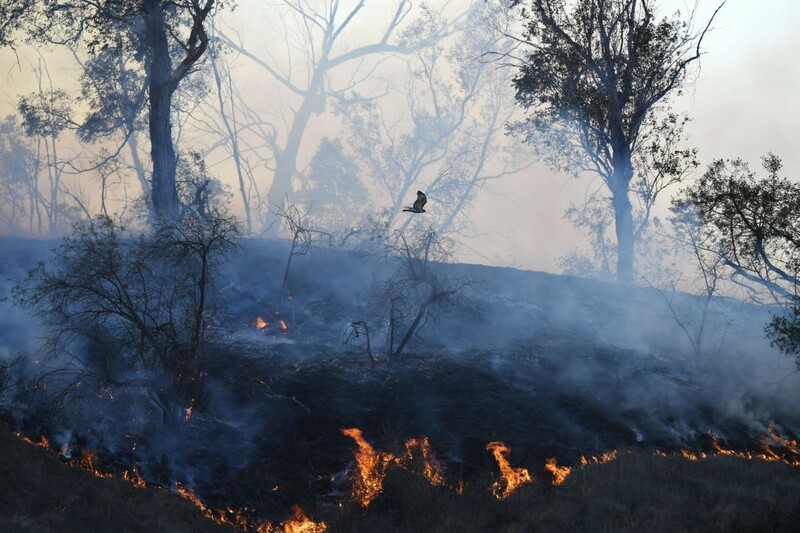 The fire has grown to nearly 110 square miles. 2:30 PM: Several rabbits were spotted against a wall at Hillcrest Drive and Black Oak Street in Thousand Oaks. Video of the terrified wildlife is going viral. 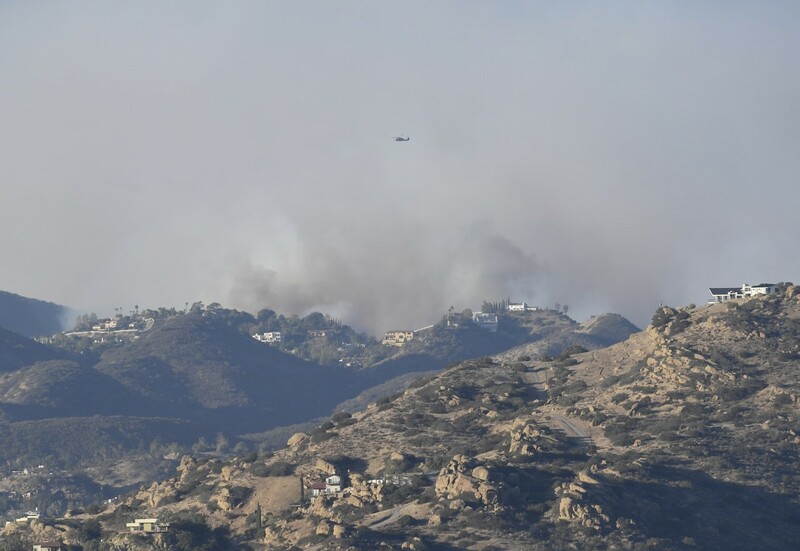 2:26 PM: The Los Angeles County Fire Department tweeted that the fire raging through the Santa Monica Mountains was headed to the ocean. 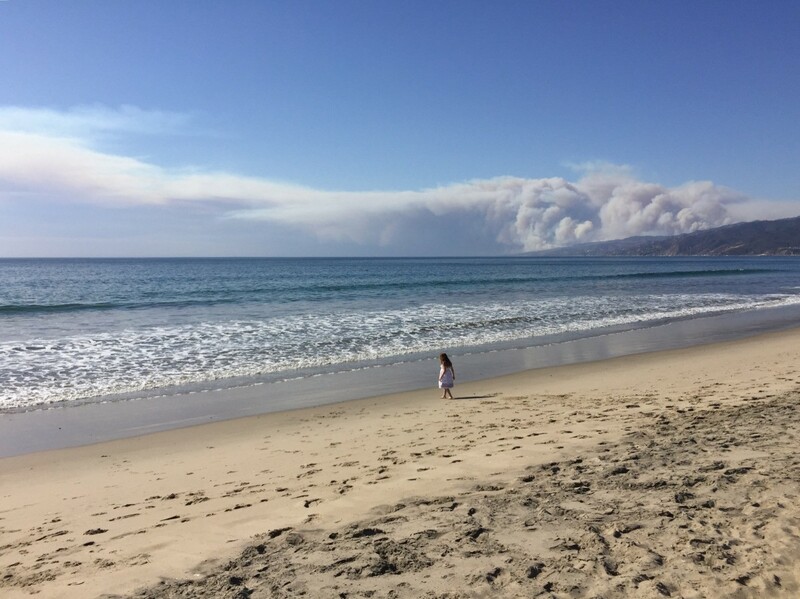 Malibu has about 13,000 residents and lies along 21 miles of coast at the southern foot of the mountain range, according to the Associated Press. “Imminent threat!” the department said in its warning. 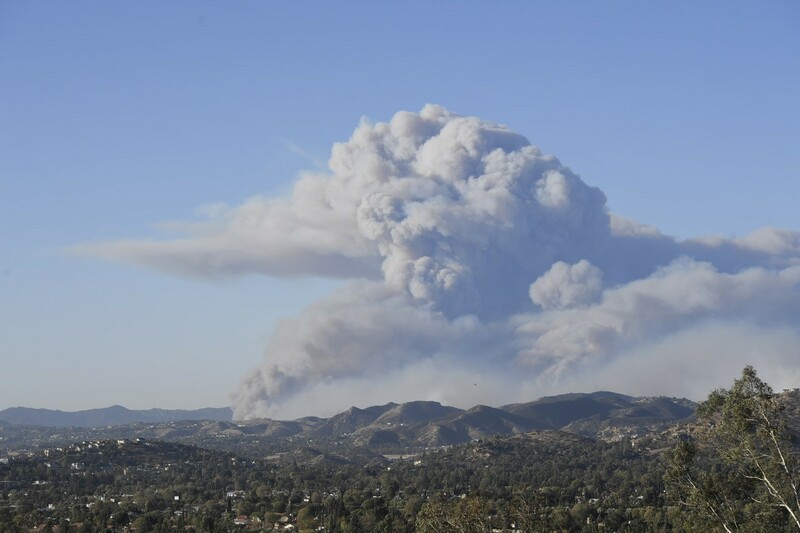 The erupted Thursday near the northwest corner of the city of Los Angeles as the region’s notorious Santa Ana winds gusted, triggering overnight evacuations of an estimated 75,000 homes in western Los Angeles County and eastern Ventura County. 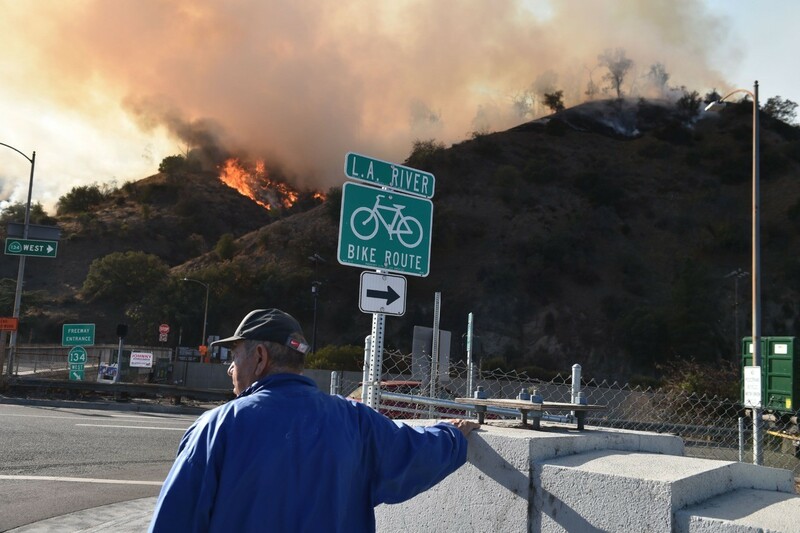 2:15 PM: Wildfire burns a part of Griffith Park in Los Angeles.